yesterday i talked about writing in journals…but what about drawing? i have been drawing + doodling in my journals for many, many moons. but it’s only been this past summer that i’ve started drawing things i really like. the tulip on the intuitive homeschool button for instance: very simple line drawings, no shadows, no cross hatching! so what’s changed? first, i found the book 20 Ways to Draw a Tree by Eloise Renouf. then i drew every day during June + July for the Index Card a Day Challenge…well, not every day, but many! most of my drawings were influenced by the book. then i took the line drawing class with Lisa Congdon over at Creativebug (free with a 2 week trial). the class helped me to dissect the drawings in 20 Ways, to understand which ones i liked and why. it also gave me ideas–like adding color on the computer–that i never would have thought of myself. 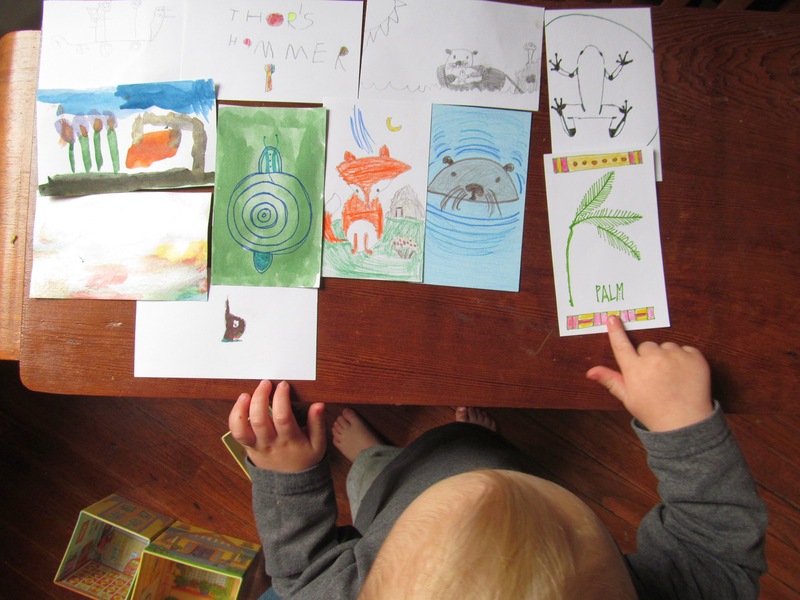 Tammy at Daisy Yellow Art hosts ICAD every year…but she shares her art + ideas all year long. Jude Siegel has written a book called A Pacific Northwest Nature Sketchbook where she talks about a kind of blind contour drawing she calls spirit drawing. fascinating! we often simply color as a spiritual practice as part of our saint day celebrations. I asked for Lisa Congdon’s 20 Ways to Draw a Tulip for my birthday and recently got it. I haven’t been able to carve out the time to really delve into it yet, but I’m looking forward to it. Still loving this series so much! Thanks! what a wonderful birthday present! can you tell the tulip i drew for the series button is heavily influenced by Congdon?! so happy to have you reading along. peace keep you.